Glass partitions and doors have gained a lot of popularity in recent times for bathroom design, mostly due to their functionality and looks. Not only do glass shower doors in bathrooms assist in keeping your room looking big, but they are also highly customizable so that you can make your bathroom door look original and unusual. Moreover, they are highly functional- glass doors do not deteriorate from moisture and high temperatures, andare much easier to care for as they don’t harbor mold to the same degree that traditional enclosures do. There are many pros to having a glass shower enclosure for your bathroom, which is why they have risen in popularity so fast. Not only are these doors aesthetically pleasing, but also cater to a lot of modern-day tastes. 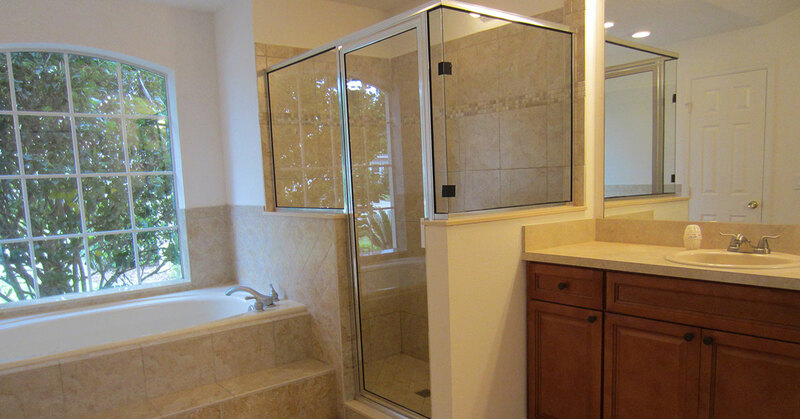 We at Dixie Shower Doors near Volusia County provide premium quality glass shower appliances for your shower needs. Call Dixie Shower Doors today for your next bathroom remodel! Protecting the surrounding area from water and steam is the main purpose of the glass shower door. You can choose the type of glassdoor depending on what you feel comfortable with, and what you personally enjoy, from a frameless shower door to a framed one, or from a thicker type of glass with etchings or a minimalist, thin door. Maintenance of your glass door is also highly easy. This is one of their major pros- glass doors are much less like to harbor bacteria, and are extremely easy to clean when compared to other types of shower doors and enclosures. The only things you need are some materials that are specifically meant to clean these types of surfaces. When choosing cleaning materials, you should make sure to check the composition and make sure that there is no formic acid, solvent, or formaldehyde. When you are in the process of cleaning your glass door, all you need to do is to apply the gentle cleaning solution to the surface you want to clean, and then immediately remove the thin layer of solution with a soft cloth. You can also leave the cleaning substance for a few minutes for a few minutes and then clean it with a soft cloth. With plastic or metal partitions, the materials are harder to take care of than glass shower doors, as the materials deteriorate rapidly in damp areas, causing you to have to change the entire structure. Glass partitions are able to be customized in a variety of ways, with a variety of patterns available. You can choose glass in either matte or with a drawing pattern, meaning that you are able to easily hide any droplets of water and stains, We at Dixie Shower Doors offer many different varieties of glass textures for you to choose from, such as Clear Glass, Rain Glass, Obscure Glass, Reed Glass, and many other styles. We at Dixie Shower Doors provide and install glass shower enclosures of premium quality. You can customize your glass shower doors to your liking, and glass doors make for a top choice when it comes to your next bathroom remodel. The transparent material of glass makes it a great choice for bathroom as it creates the appearance of space, and increases the room visually. Moreover, these types of doors look fantastic with all types of rooms, making it one of the few materials that are versatile enough to work well with both metal and wood, ceramic tile, or even natural stone. Call Dixie Shower Doors today for your next bathroom remodel!